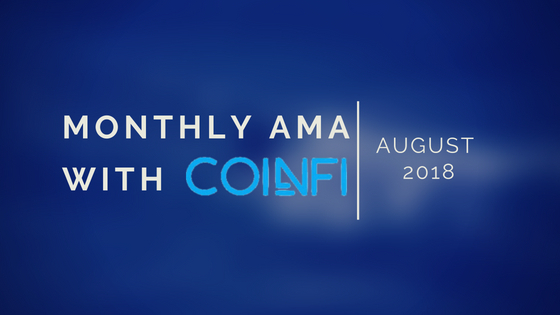 No matter where you’re reading this August CoinFi update, we hope you’re feeling good! For us, it’s summer in Hong Kong. With the sun blazing and a humidity of over 80%, things are getting a little sweaty. Outside it feels like the entire city is on fire. Fortunately, that’s how we feel on the inside here on the CoinFi team! So what have we been up to and why are we so pumped? After hundreds of hours from our engineering team and a ton of anticipation from the CoinFi community, we started rolling out the CoinFi News closed beta at the end of July. While the product is still in an early beta testing stage, the response has been overwhelmingly positive and tells us that we’re headed in the right direction. We’re gathering crucial user feedback and doing in-depth user testing that will continue to guide product development, and we’re still working furiously to improve the product and launch new features. If you already have access to the closed beta, we strongly encourage you log into the platform and give it a whirl. You can use both the “Feedback” link on the top menu as well as the “Report a Bug” button at the bottom right of your screen to communicate your thoughts. You’ll interact directly with the product team to help us build the perfect tool to serve crypto investors like yourself. Thanks to the valuable feedback already provided by our beta testers and user testers, we’re confident that by the time we publicly launch CoinFi News, it’ll be the clear #1 choice for investors who want to keep up with the crypto markets. Remember, CoinFi News is just the first in a long line of features we are rolling out this year. Earn Some of the 10,000 COFI We Give Away Every Week! Last month we launched the private CoinFi Ambassadors telegram group. The group currently sits at over 100 dedicated members and is growing fast. The purpose of the Ambassador program is to focus the efforts of CoinFi supporters, with the goal of spreading excitement about CoinFi’s vision and platform. It’s also the first place the team comes to for product feedback/suggestions. We’ve set aside a pool of 500,000 COFI tokens that Ambassadors will have a chance to win by taking actions to spread CoinFi’s vision. Out of that pool, we’ve been giving away 10,000 COFI tokens every week. 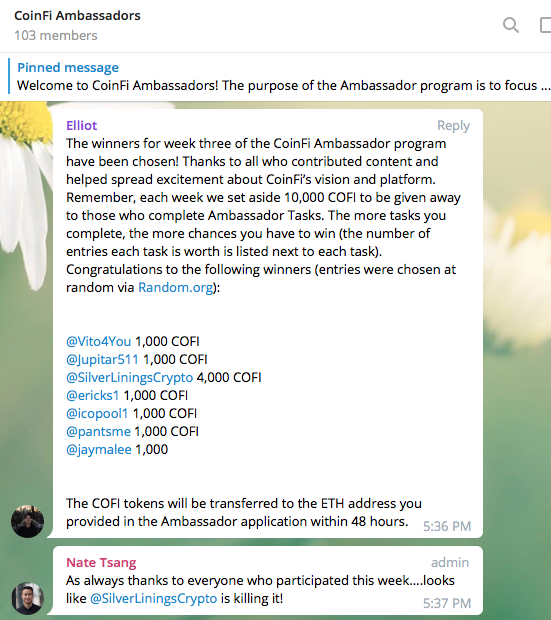 If you want to help spread the word about CoinFi and win COFI for your efforts, you can apply here here to join us in the private CoinFi Ambassadors telegram group. How Does Bitcoin Impact A Traditional Portfolio? 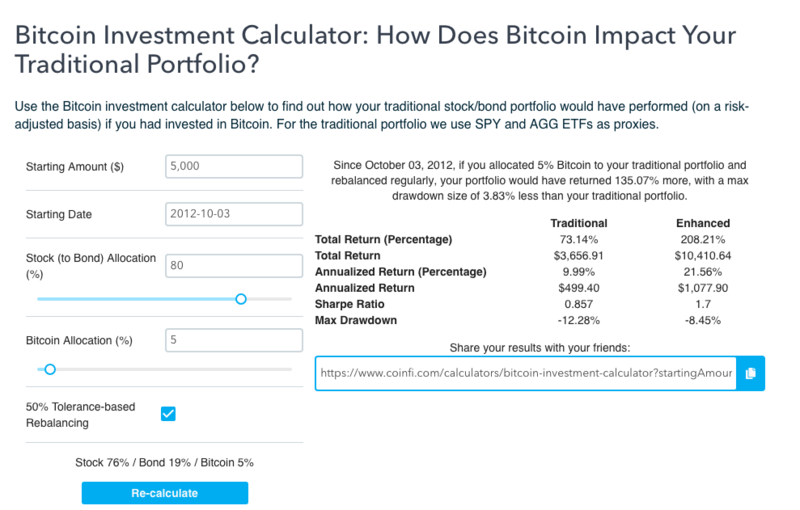 We recently released a Bitcoin investment calculator to show investors how a traditional stock/bond portfolio would have performed (on a risk-adjusted basis) with a small % allocation to Bitcoin. If you’ve ever asked yourself – “How much of my money should I allocate to crypto?”, the research report we meticulously crafted below the calculator goes into detail on how to use this nifty tool and highlights some interesting scenarios for discussion. It’s obviously not surprising that allocating a small % of your portfolio into Bitcoin over the last few years would have had a positive impact on your portfolio. 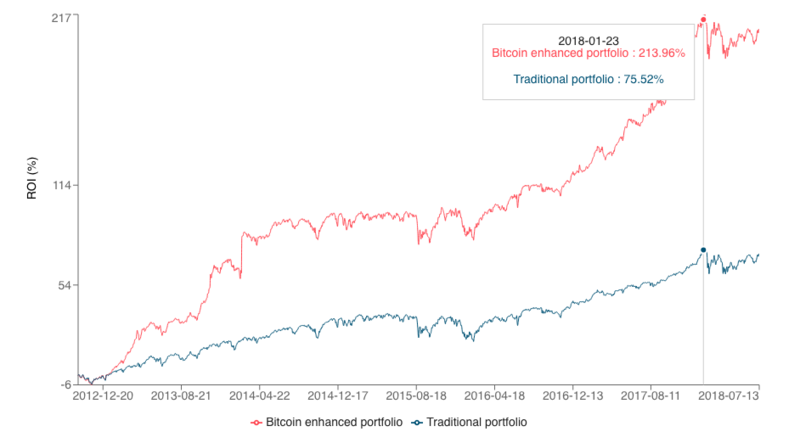 However, what we found truly fascinating from our backtesting, was the tremendous impact that rebalancing has on the risk profile of a Bitcoin investment. With rebalancing, you can still gain a lot of the upside of a high potential ROI (but highly volatile) investment like Bitcoin, with significantly reduced risk. So go ahead and play around with the Bitcoin investment calculator to see how adding a little bit of Bitcoin into your portfolio and rebalancing would have historically performed on a risk-adjusted basis. And if you find it interesting, don’t forget to share the numbers with your friends (there’s a handy share link in the calculator), especially those who aren’t crypto converts! While most of our team has been focused on product and engineering, we’ve also continued to allocate resources to business development. At the end of June, we kicked off our exchange listing strategy with the Cobinhood listing. On July 11, CoinFi Expands Reach to China with Listing on FCoin Exchange. While we can’t promise that we’ll be listed on new exchanges every month, rest assured that we are actively executing our exchange listing strategy, and we will have more exchange related news in the coming months. Our objective with our exchange listing strategy is to give exposure to the COFI token to as many buyers as possible, so as we unlock the token utility we’re currently building, as many users as possible will have access to the CoinFi ecosystem. We launched The CoinFi Podcast in July as a way to share some of the crypto conversations we have in the office, while building thought leadership and connecting with the CoinFi community. 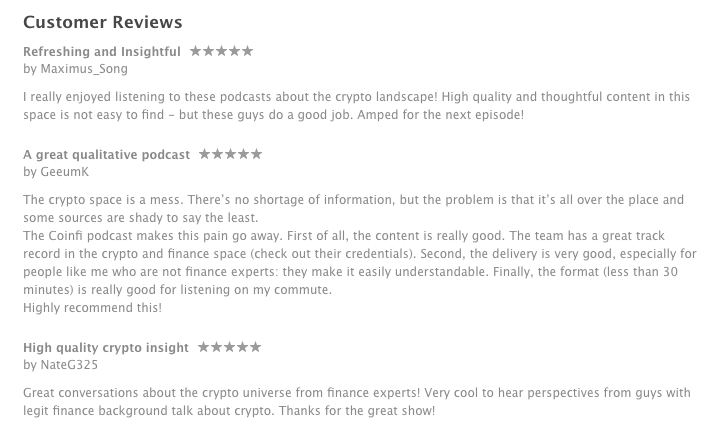 We were hoping these candid conversations that happen daily in the CoinFi office would provide insights and value to our listeners, and from your responses so far it certainly has! You can expect a new episode every Friday morning HKT. Our podcast is available on the following channels for both iOS and Android users. If you like our podcast, we’d love to gain you as a subscriber. We’d also very much appreciate if you could take a minute or two to leave us a 5-star review. It’ll help us reach more people with the CoinFi podcast and help us grow the CoinFi community. Of course, we’re always looking for ways to improve. If you have constructive feedback on how we can improve the podcast, please do not hesitate to reach out by replying to this email. We read every single one and appreciate your constructive feedback! As part of our renewed focus to share what we’re building here at CoinFi with the rest of the crypto world, we are actively putting ourselves out there to share, to connect, and to learn. 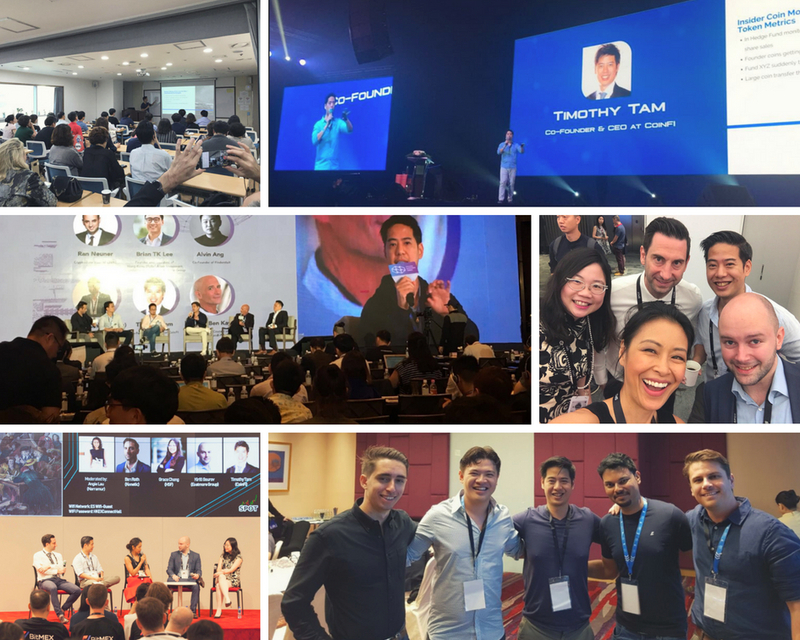 Throughout the month of July, our CEO Tim Tam was in Taiwan, Korea, Hong Kong, and Thailand for blockchain conferences sharing his insights into the crypto markets, and showing the crypto world the impact CoinFi will make in the crypto trading space. On July 2 and July 3, Tim was on two panels sharing his knowledge and insight regarding regulatory problems and token trading at Asia Blockchain Summit. From July 15 to July 22, Tim spent an entire week in Korea for Blockchain Partners, Beyond Block Summit, Korea Blockchain Conference, as well as a CoinFi meetup in Seoul. The next day, on July 23, Tim appeared on the stage of SPOT Conference in Hong Kong as a panelist. One week later, Tim went to Bangkok, Thailand to present at Hybrid Summit as a keynote speaker and sharing his crypto trading experience with other crypto thought leaders. We’ve had numerous requests from the community for an AMA with the founders and the core team. Since January, we’ve had our heads down building the company, but as our team grows and we start rolling out more product, we’ve been able to start putting back more time into the community, where it truly belongs. Starting this month, we’ll be running a short AMA every month on Reddit. At the beginning of each month, we’ll set up a Reddit thread. If you have a question you’d like to ask the CoinFi core team, just post it in the comment area. You can ask multiple questions. Just separate each question in a different comment. After a week, the top 10 questions that get the most upvotes from the community will be answered. August AMA is live now and we’ll be responding on August 8, 2018 HKT. So shoot your questions over. With the team at 18 full-time CoinFiners and growing fast, it’s becoming impossible to pack everything that’s going on at CoinFi into a monthly update. Aside from CoinFi News, we haven’t even had a chance to go into an update on the other exciting suite of products we’ve been developing. Rest assured, we are continuing to develop the products mentioned in previous updates and shown on our roadmap. As we get closer to release, you’ll be seeing more updates on those fronts as well. If you’re excited about the momentum we’re building up here at CoinFi, come say hi to the team on telegram. We’re in there all the time answering questions and absorbing your feedback, especially in the private Ambassadors group.